AFS global deployments strive to help customers achieve success at the retail shelf as the selling space gets tighter. Phoenix, Ariz – Dec 20, 2017 – AFS Technologies, a leading global provider of software solutions purpose-built for consumer goods companies, today announced that the company has been recognized in Gartner’s 2017 Market Guide for Retail Execution and Monitoring Solutions for the Consumer Goods Industry. 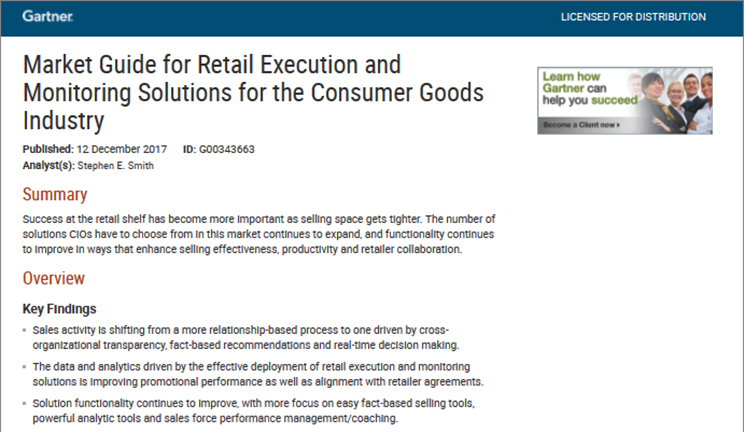 The report offers a view of the marketplace and vendor offerings in retail execution and monitoring solutions for the consumer goods industry. Read the full Gartner report. AFS has multiple product offerings: AFS Retail Execution/DSD, AFS POP, AFS DSD. These are compatible with IOS, Android and Windows. The solutions are available for both the private and public cloud as well as on-premise. AFS Technologies is one of only six companies that have reported implementations in every geography; the largest regional presence is North America and Asia Pacific, with a growing user base in Europe. AFS Retail Execution suite are an easy-to-use, flexible and robust mobile solution—designed to be used by field sales, merchandising and delivery teams to improve field efficiency as well as drive increased market share, revenue and margin per square foot. Case studies are available for Carlsberg, Whyte and MacKay, and SpinMaster.